This month the members of my book group are reading Jewish author Stefan Zweig’s only full-length novel, Beware of Pity, which he completed in 1938. Returning to 1914, we find Hofmiller as a young, idealistic officer, one who is somewhat impoverished compared to his fellow cavalrymen. One day, by way of a mutual friend, he receives an invitation to dinner at the home of Herr von Kekesfalva, the richest man in the district. But unfortunately for the young lieutenant, this is where his troubles begin. Hofmiller arrives late to the dinner but is welcomed with open arms by Kekesfalva and his pretty niece, Ilona. Faced with an array of the finest dishes and wines, the young lieutenant gets carried along by the experience and his usual shyness falls away as he chats with Ilona. But as the evening draws to a close, Hofmiller realises that he has forgotten to ask his host’s daughter, Edith, to dance. When he does so, the young girl cries out in anguish; unbeknownst to Hofmiller, Edith is partially paralysed, unable to walk more than a couple of paces even with the aid of crutches. On discovering his faux-pas, Hofmiller is mortified, and he runs from the Kekesfalvas’ home in fright. Consequently, he is deeply ashamed of his actions and worries that his folly will be the talk of the town and his regiment. At pains to make amends, Hofmiller sends Edith a basket of flowers by way of an apology and is delighted when, in return, he receives an invitation to tea at the Kekesfalvas’. All is forgiven, and the lieutenant is welcomed into the fold of the Kekesfalva family where he feels moved by the positive effect his presence has on Edith’s spirits. At the age of twenty-five, Hofmiller is rather naïve and inexperienced in the emotional complexities of human relationships. He feels for Edith’s plight and is enthused when the sympathy he shows towards the girl brightens her eyes and brings light to the Kekesfalvas’ rather gloomy household. Slowly but surely, Hofmiller gets drawn into to a complex web, an emotional entanglement involving the whole Kekesfalva family. Edith becomes increasingly dependent on his visits. Meanwhile, Hofmiller begins to worry about the perceptions of others – do his comrades think he is taking advantage of the Kekesfalvas’ generosity, for instance? When Hofmiller fails to show at the house one day, Edith is distraught. 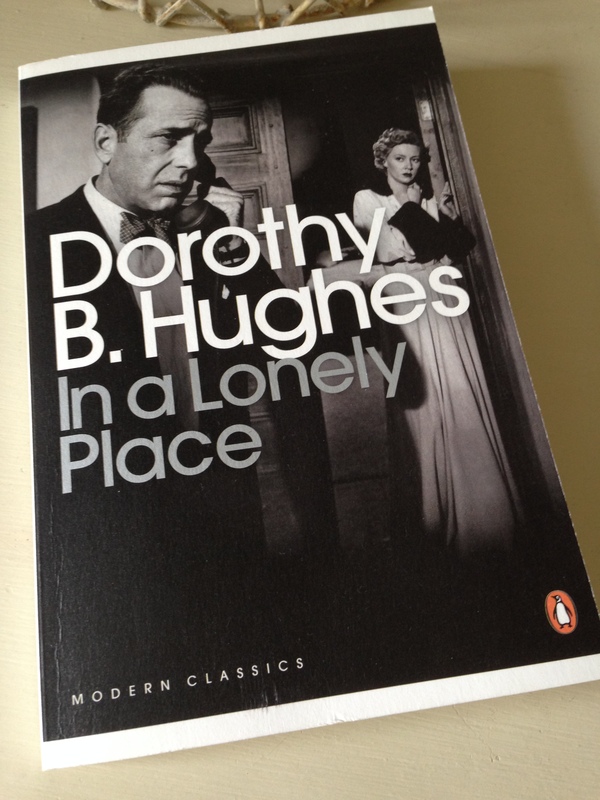 It soon becomes clear that Edith does not want the lieutenant’s pity – what she desires is Hofmiller’s true affection, she is deeply in love with him. Unfortunately for Edith, Hofmiller is horrified by this discovery – he views her purely as a friend. The situation is exacerbated by Herr von Kekesfalva’s fixation on finding a cure for Edith’s condition. He is absolutely desperate to see her happy and settled before he dies (the strain of caring for this demanding child is taking its toll on his health). As a result, Kekesfalva – perhaps unwittingly, as he appears well-intentioned – places a significant emotional burden on Hofmiller to continue visiting Edith. Every time Hofmiller tries to extricate himself from the situation, the mere sight of Kekesfalva tugs at his heart strings making it impossible for him to turn away. By turn, Edith is equally desperate to be able to walk again for the sake of Hofmiller. She is pinning all her hopes on a new treatment, one she believes will make her better and fit for a life with the lieutenant. Unfortunately, while Hofmiller knows that this treatment will prove ineffective in Edith’s case, the Kekesfalva family do not. (Edith’s physician, Dr Condor, has confided in the young lieutenant.) This leaves Hofmiller with a terrible dilemma. Should he tell Edith the truth, that the new treatment is pointless, an action almost certain to trigger a deep emotional crisis in the girl? Or should he encourage her to embark on the therapy in the knowledge that it will buoy her spirits and buy him some breathing space albeit temporarily? 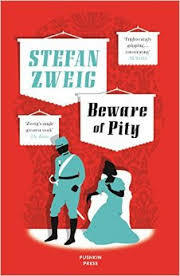 Beware of Pity is a rich and gripping novel, one that sweeps the reader along to its dramatic conclusion. The characters are complex; each of the main characters – Hofmiller, Edith, Kekesfalva and Dr Condor – has their own individual failings. There is even time for a brief diversion within the novel – the story of how Kekesfalva made his fortune could be a novella in its own right. Ultimately though, this is a novel about moral and ethical choices, the consequences of our actions, and the trouble that sheer weakness can cause (perhaps even more than brutality or wickedness). I’ll finish with a quote from Dr Condor that gets to the very heart of the novel (he is speaking to Hofmiller). A similar version of this passage also appears as an epigraph. For the interested, there is an excellent introduction to the novel by Nicholas Lezard here (published in The Guardian). Beware of Pity by Stefan Zweig (tr. Anthea Bell) is published in the UK by Pushkin Press. Source: personal copy (ebook). This entry was posted in Book Reviews, Zweig Stefan and tagged #GermanLitMonth, #TranslationThurs, Anthea Bell, Austria, Book Group, Book Review, Fiction, Literature in Translation, Pushkin Press, Stefan Zweig on June 29, 2015 by JacquiWine. 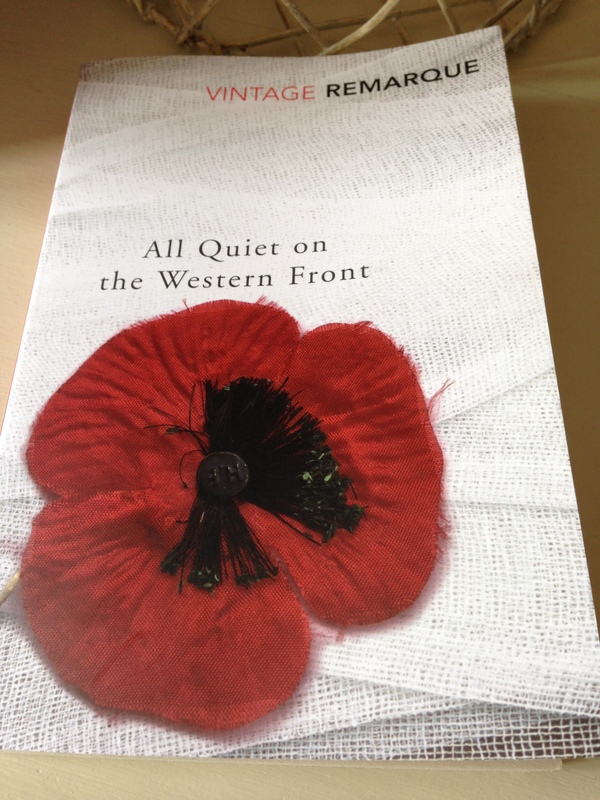 With the centenary of the start of the First World War in mind, the members of my book group have been reading All Quiet on the Western Front by Erich Maria Remarque. Remarque, born in Germany in 1898, drew on some of his own experiences in WW1 to write this incredibly powerful and unforgettable novel, first published in 1929. It’s also a great choice for Caroline and Lizzy’s German Literature Month which will be running throughout November, but I’ve posted this review today in time for this week’s book group discussion. They were supposed to be the ones who would help us eighteen-year-olds to make the transition, who would guide us into adult life, into a world of work, of responsibilities, of civilized behaviour and progress – into the future. […] Our first experience of heavy artillery fire showed us our mistake, and the view of life that their teaching had given us fell to pieces under that bombardment. As the novel moves forward, we follow Bäumer and his unit as they try to survive both the physical and mental effects of the war. There is a strong sense that Bäumer represents a universal soldier; he could be any one of the terrified young soldiers sent to the front, desperately trying to get from one day to the next, never knowing what the next few seconds might bring. This young man realises that he has become brittle and damaged by the war, and as he struggles to come to terms with his feelings, it’s as if a great chasm has opened up between the memories of his former life and his current perception of the world. Bäumer finds it so difficult to connect with his family and the people back home that he prefers to be alone, and he wonders if he will ever be able to build a life for himself after the war. Other (older) soldiers have wives and children to return to, but Bäumer is part of the lost generation, the boys who went straight from school to war, those with no other experience of adult life to cling to. All Quiet on the Western Front is a deeply affecting book, almost unbearably so at times for all the reasons I have already mentioned. We gain an insight into a war characterised by terror, both the fear of waiting for conflict and the shock of coming face-to-face with it. Alongside this portrayal, the novel also captures the camaraderie between soldiers in moments of battle and quieter times. We follow Bäumer as he carries an injured soldier (his closest friend in the unit) to safety. We see the soldiers cooking a feast while under fire as they stand guard over a supply station in an evacuated village. The taunting of their training commander, the vindictive Himmelstoss (now posted out to the conflict), provides a few moments of light relief. Above all else though, we are left with a searing portrait of the suffering, desolation and futility of war. As I was reading All Quiet, I couldn’t help but mark several sections of the text, and I ended up with far too many quotes to include here. But I’ll finish with one final quote, a passage that gets to the essence of this book for me. I wish I had read this novel many years ago; I’m sure I’ll read it again. All Quiet on the Western Front (tr. by Brian Murdoch) is published in the UK by Vintage Books . Source: personal copy. This entry was posted in Book Reviews, Remarque Erich Maria and tagged #GermanLitMonth, #TranslationThurs, Book Group, Book Review, Brian Murdoch, Erich Maria Remarque, Fiction, Germany, Literature in Translation, Vintage Books on October 28, 2014 by JacquiWine. 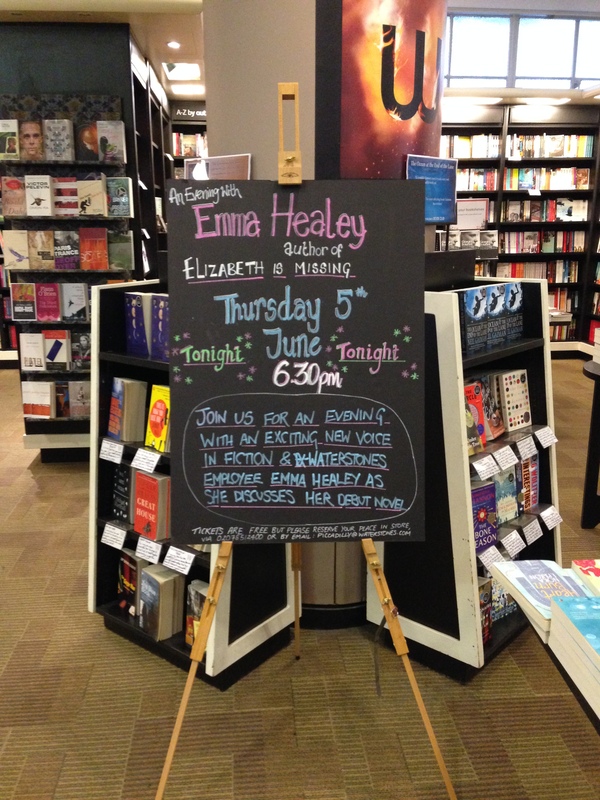 Next month our book group will be reading Elizabeth is Missing by Emma Healey. It’s Healey’s debut novel, and there’s been quite a buzz about it in the press and amongst some of the bloggers I follow. So when I saw that Waterstones Piccadilly was hosting an event with Emma on the evening of the book’s publication, it was too good an opportunity to miss. My book-group friend and I headed into London on Thursday afternoon, and we had a thoroughly enjoyable evening. To start the event, Emma read an extract from her book. The novel is narrated by Maud, an eighty-two year old woman with dementia, and we joined the novel at the point where Maud finds herself lost in a department store. In her confusion, Maud accidentally knocks an expensive Waterford crystal vase from the shelves and is accosted by a shop assistant who thinks Maud might have to pay for the damage. Healey gives us a piercing insight into the mind of a dementia sufferer as Maud struggles to remember her address. Luckily for Maud, she is rescued by her daughter, Helen, and we see how their roles have reversed over time – Helen was always running away as a child, but now it is Maud who needs to be looked after. After the reading, literary agent Karolina Sutton chaired a discussion with Emma on the novel’s themes and influences. My note-taking skills aren’t good enough to record verbatim responses, but I hope I’ve captured the sentiment behind their conversation. When asked about the inspiration for the book, Emma spoke of her own grandmother’s experience of dementia, and how, in the early stages of her condition, her grandmother thought someone was missing. As her grandmother’s dementia worsened, Emma was inspired to use this initial experience as a jumping-off point to explore what happens to a person as their condition deteriorates. Emma was keen to explore Maud’s logic and way of thinking – with dementia, there is so much going on under the surface and in the mind of the sufferer that others cannot see. And so Maud’s story became a means of illustrating these thoughts, one that enables us as readers to empathise with an individual who is living with the condition. Emma also wanted to explore the experience of being a carer, which she does through Helen’s character (as an aside, Healey feels more could be done to support carers in the UK). Maud reaches the stage when she can no longer remember who Helen is, and so her connection to her daughter breaks down. In terms of research for the dementia strand of the story, Emma looked at how dementia sufferers tend to present in the early stages of the condition. Individuals with dementia often repeat certain patterns of behaviour (and she illustrates this in the book through Maud’s purchases of several tins of peaches). In some instances, dementia sufferers can hold on to a thought or memory until they walk through a door, only for it to disappear once they pass over the threshold. Doorways seem to be quite significant when it comes to memory and dementia, and Emma used this idea in her narrative. As a dementia sufferer’s short-term memory fades, the idea of living in the past is augmented. And so, in Elizabeth is Missing, Maud becomes more interested in her early life. The novel’s story contains another strand, a mystery that takes us back in time to the period just after the end of the Second World War, and Healey wanted to use this as another means of exploring Maud’s condition. As Maud thinks back to her childhood, it is almost as though she’s transitioning between two worlds – the present day and her life in the 1940s. At the end of World War II, Britain was in a state of flux, and Emma felt that this period of change and turmoil in British history fitted with Maud’s state of mind in the present day. Also, a number of people disappeared or never came home after the war, and so this made the mystery element of the narrative feel quite plausible. Emma conducted much research into the post-war age by reading novels and newspapers from 1946. The 1947 British film It Always Rains on Sunday, starring Googie Withers, was a valuable reference source – in fact, a quick bit of research tells me that this film was re-released earlier this year, and a digitally-remastered version is also available on DVD. 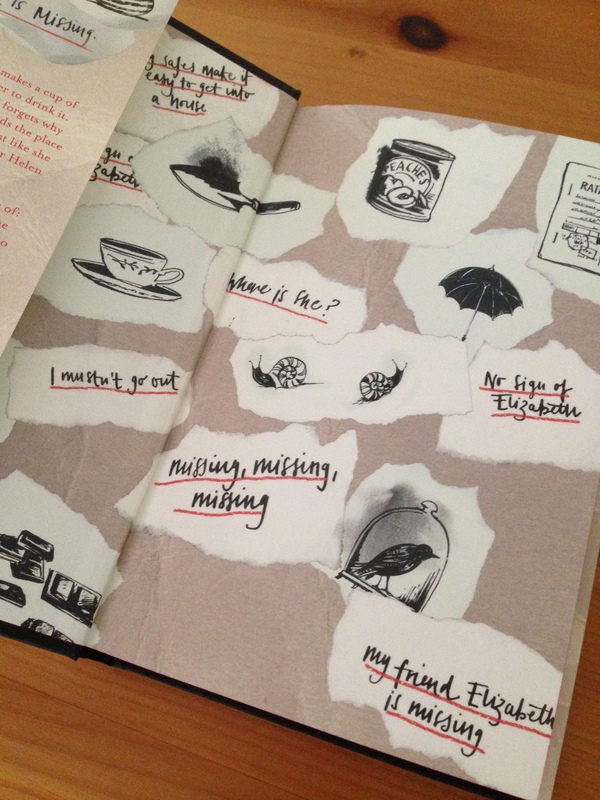 In terms of the writing process, Elizabeth is Missing took Emma five years to write alongside a full-time job and a year of study on a creative writing course. Healey is a passionate advocate of creative writing courses and believes they are a fantastic opportunity to learn this skill – she spoke of benefiting hugely from the critical analysis of her work by other writers. From an early stage in the course of writing this book, Emma knew how the story would end, but not the full narrative from start to finish (although she clearly wanted to include a mystery element alongside the dementia theme to keep readers engaged). While the story’s subject matter is a serious one, Karolina and Emma were keen to point out that the narrative also contains humour and isn’t as bleak as it might sound. Emma spoke of how writing the book took a tremendous amount of willpower and discipline on her part. She received much support from her partner, who brought her cups of tea in the evenings as she wrote and ensured she didn’t leave her room until she’d completed her allotted hour of writing. There was plenty of time for questions from the audience, and the number and diversity of these questions illustrated just how much interest there is in this story and Emma’s approach to the book. The evening finished with a book signing, and Emma was very generous with her time and keen to chat as she signed. Oh, and the book itself is a thing of beauty – Viking and Penguin Books have done a terrific job with it! All in all, it was an excellent evening – very interesting, informative and heartening. If you have an opportunity to see Emma at a future event, grab it with both hands – she’s an excellent and engaging speaker and it was a delight to meet her. And now I can’t wait to read the book! We’ll be discussing it at our book group in mid-July, so I’ll post my review near the time (update: I’ve added a link to my review here). 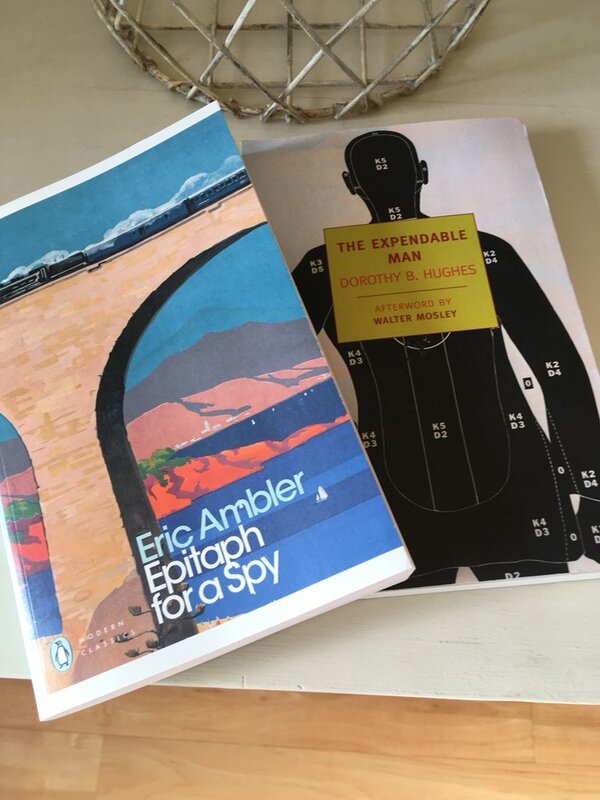 In the meantime, a few other bloggers have reviewed Elizabeth is Missing, so just click on the links if you’d like to read their thoughts: Naomi at The Writes of Women, David Hebblethwaite at Follow the Thread and Helen at MadaboutheBooks. It sounds as if we’ve got an excellent read to look forward to. 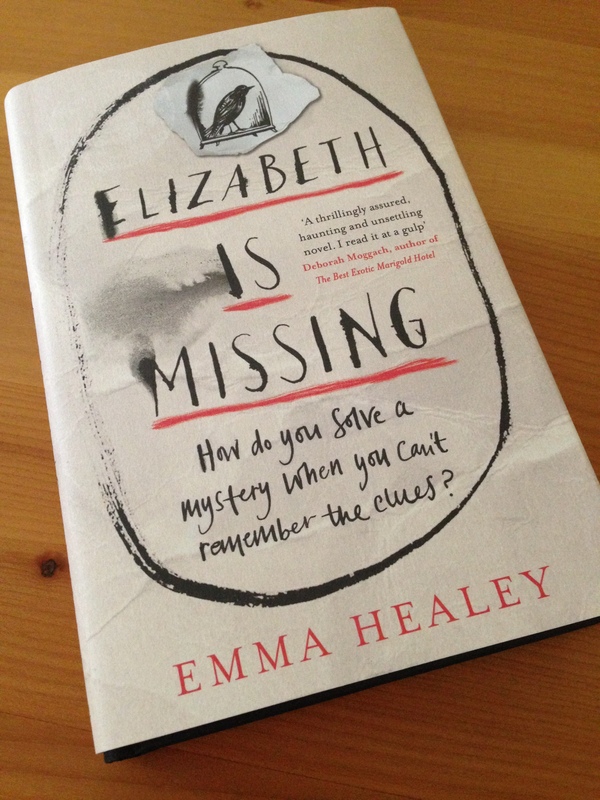 This entry was posted in Book Reviews and tagged #ReadWomen2014, Book Group, Elizabeth is Missing, Emma Healey, Fiction, Penguin Books, UK on June 8, 2014 by JacquiWine.